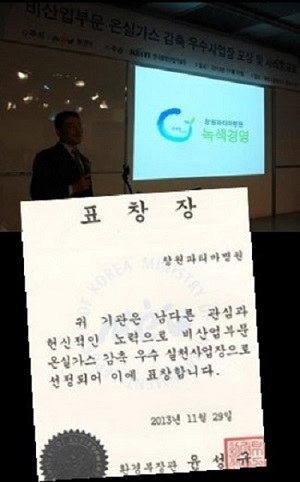 Changwon Fatima Hospital was recognized by the Korea Environmental Industry & Technology Institute as the 2013 Award GHG recipient of the year. Changwon Fatima Hospital has been practicing eco-friendly lifestyle on the daily life of the hospital through reduction of greenhouse gas, replacing lamps with LED lighting and cold water circulation pump besides promoting the reduction of wasted food and energy. According to Sr. Vianney Park, CEO of the Hospital, the main concern of the Hospital is not on simply caring for the sick and the patients, but also on the health of the whole Earth, which requires small sacrifices on a daily basis. Changwon Fatima Hospital is a model for daily life in each home. And the Hospital will keep promoting a better and more beautiful environment for all.